1. Melt half the butter in a large non-stick frying pan over medium heat until hot. Add mushrooms and cook until tender. Spoon mushrooms into a sieve and set aside over a bowl to cool 10 minutes. 2. Place the flour and bicarbonate in a large bowl. Make a well in centre. Add milk and egg. Mix until the batter is smooth. Stir half the cooked mushrooms and all the corn and cheese into the batter, mix gently to combine. 3. Wipe the frying pan clean and heat over medium heat. Brush with a little of the remaining butter. Spoon a small ladleful of batter into the pan, cook 2-3 minutes until bubbles appear on the surface. Turn pancake over and cook a further 4-5 minutes or until cooked through. Transfer pancake to a clean tea-towel and cover loosely to keep warm while making the remaining pancakes. 4. 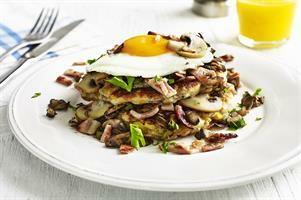 Serve topped with remaining cooked mushrooms, add bacon and a poached egg if desired. They are also delicious topped with mushrooms and a dollop of reduced fat cream cheese.